This July 22, 2018, satellite image released and annotated by 38 North on Monday, July 23, shows what the U.S. research group says is the partial dismantling of the rail-mounted transfer structure, at center, at the Sohae launch site in North Korea. The U.S.-based North Korea monitoring group 38 North said recent satellite images show North Korea has begun dismantling key facilities at the Sohae Satellite Launching Station on the country's northwest coast. 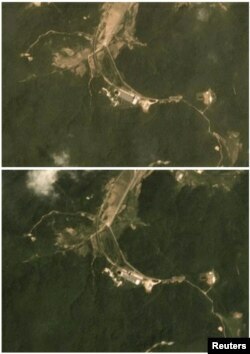 The satellite images show the dismantling of a rail-mounted processing building, where space launch vehicles are assembled before being moved to the launch pad, and the nearby rocket engine test stand, where liquid-fuel engines are developed for ballistic missiles and space launch vehicles, 38 North said. 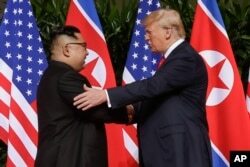 38 North analyst Joseph Bermudez called the move an "important first step towards fulfilling a commitment" made by North Korean leader Kim Jong Un during his summit with Trump in Singapore. Earlier Monday, U.S. President Donald Trump declared that he is "very happy" with the pace of ongoing negotiations with North Korea to end Pyongyang's nuclear weapons program, rebuffing news accounts to the contrary. "A Rocket has not been launched by North Korea in 9 months. Likewise, no Nuclear Tests. Japan is happy, all of Asia is happy," Trump said on Twitter. "But the Fake News is saying, without ever asking me (always anonymous sources), that I am angry because it is not going fast enough. Wrong, very happy!" A day after the summit last month Trump said in a tweet, "There is no longer a Nuclear Threat from North Korea." But their agreement contained no details about when or how North Korea would abandon its nuclear weapons program or shut down its existing nuclear facilities. U.S. Secretary of State Mike Pompeo met in Pyongyang recently with North Korean officials to try advance discussions, but there appeared to be little progress. Some diplomats say the North Koreans have canceled meetings and failed to maintain basic communications with the U.S.
U. S. President Donald Trump shakes hands with North Korea leader Kim Jong Un at the Capella resort on Sentosa Island, June 12, 2018 in Singapore. As he did Monday, Trump has publicly professed satisfaction at the pace of negotiations with North Korea, saying last week there was "no rush" in completing talks with Pyongyang because U.S. and United Nations economic sanctions against North Korea remain in place. On Monday, the U.S. State, Treasury and Homeland Security departments said, "The international community cannot let up on pressure" until North Korea ends its nuclear weapons program. Trump said last week that U.S. relations with North Korea "are very good and the process is moving along." He said that with eventual denuclearization, there would be "big benefits and exciting future for North Korea at end of process!" But several news outlets have reported in recent days that behind the scenes at the White House Trump has voiced his displeasure to aides at the pace of talks in pushing North Korea to abandon its nuclear weapons program.